…a beautiful woman with a pair of shapely legs just caught your eye as she’s walking by. Immediately you need to see more. Luckily, the object of your desire is not far away from you and she’s wearing shorts, or a mini-skirt, and walking with friends. You subtly take your group into a direction that will put you on course to follow this leggy goodness. Your friends continue talking and even though you can hear them, your brain isn’t really processing anything they are talking about because you’re focused on her killer legs, as well as not looking like you’re stalking her. Occasionally you hear a word from your friends talking that you recognize and you respond with a “yeah”, “uh huh”, “I know” and continue to focus on her calves. 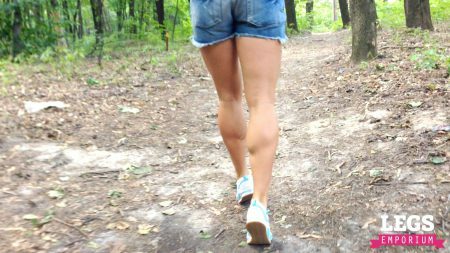 Watching those calves flex and relax as she’s walking; seeing her hamstring contort with each repeated movement, occasionally catching the backside of her thighs–the outer groves, as they retract and jiggle with each step is driving you crazy. As she continues walking you just want to keep staring and staring and staring. 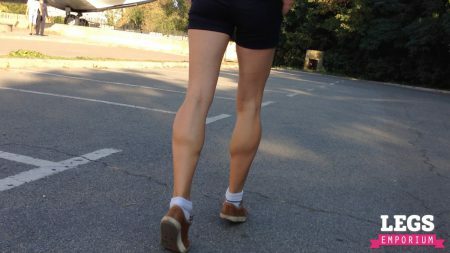 Then she turns, and you get to see the shape of the profile of her legs….Does her calves have depth from the side, they certain do from behind. Now the thigh is much more prominent and it’s flexing as she continues to strut. You’re smiling now. She has great legs, and those calves are rockin’! Your thoughts are intensely all about her legs now. Suddenly, her and her friends turn around and start walking towards you, not to approach you but apparently they passed something they didn’t want to miss. Sadly, you don’t want to be caught ogling her, so you get a last shy peek and then look away. Damn it, it was nice but you want more. Well….That’s where we come in. 🙂 This is what we do! We film as many different styles of beautiful female legs as possible, and when space allows it, we film them legs doing that most beautiful of simplistic motions…walking. Because as a Legaphile we know the value of a pair of beautiful legs walking; the movement, the different shapes and curves, that perfect moment between each stride, one leg straight–calf flexed, while the other swings past it, slightly bent–calf muscle loose, forming a bulbous shape aided by motion and gravity, creating views of the leg that aren’t so easily mimicked in poses. It’s so simple and yet so beautiful. We’ve put together these two highlight clips of moments from our library of footage, both released and unreleased, specifically about women walking just for you. If you like what you see we’ve got plenty more that aren’t featured in these presentations like Elena in Venice “Legs Goddess Stalked in Venice“& “Legs Goddess of St Marcos Square” and so much more. A full updated list can be found below. YES!! I’m so glad you took the time to highlight one of my favorite aspects of leg fetishdom! As awesome as leg crossing and other sitting poses are, there’s nothing that catches my eye faster and makes the heart rate kick into over drive like fine legs while they’re walking. You did a perfect job summing up why too…the back and forth of flexing and non flexing! It’s almost hypnotic! I’ve been hoping to see more walking and standing poses, but looks like we’re definitely on the same page with the walking one…didn’t realize how many were released in the past, but soooo glad to see new ones in the future; and that Jewel clip, good lord, just about gave me a heart attack!! My little quick two cents before I go, I’d love to see some standing poses that are filmed in a style that looks “candid” and shows a model as she stands as if she’s waiting for something…she starts to tap the toes as well as the heel of her shoes; flex her legs; stand on one leg; nervously and impatiently jiggle her legs; etc. There’s a lot of potential material here. You can even observe what your models are doing as they wait between shoots and you can have them recreate that! Let me know what you think!